Take advantage of a cost effective communications solution utilizing the latest in two-way technology! Give your business a competitive edge by providing your workforce with digital two-way radios that are more powerful and flexible, operating on a wide area network giving you the bottom line results you need for today and the advanced wireless technology you will need for tomorrow. Clearer, wider voice – The enhanced audio of Mototrbo minimizes static and noise so communication is clearer and easy–to-understand over a wider area than analog. Real time GPS people & asset tracking – With added GPS tracking, your response time is more efficient, your customer service is more effective, and your operation is far more productive. Reliability – Unlike push to talk telephones, radios are built tough for the rugged demands of commercial activity. Extended hours – You can keep radios in service longer between recharges. Battery life is 40% greater because power needed is half of what is needed for analog. Convenient text messaging – Make sure your employees can quickly and easily share information when voice communication isn't an option. Text messaging is ideal for sending messages when conversation could disrupt customers, patients, students or guests. Please contact us so we can discuss the low cost affordability of the Tuway Smart Radio Network, along with how we can set up a customize solution that will meet your business needs. 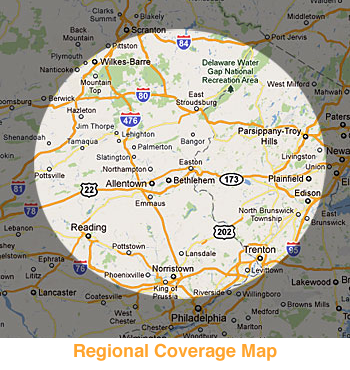 Call us today at 610-865-3811 or contact us to let us know how we can contact you.